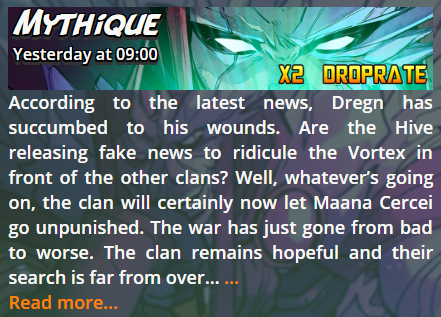 All is not lost…but from June 29th, Dregn will be joining the Mythic ranking, so from now until then, enjoy a triple drop rate in the Collector packs to get hold of him. Until the next installment! Is Dregn CR in the gold, silver or bronze CR pack? You said "enjoy a triple drop rate in the Collector packs" so we have to assume as it's plural Dregn is in all 3 packs? He's in Silver boxes at the moment. When you click on pack, there is list of cards you can get. Dregn is in silver pack. So, it should be tripple drop-rate on Dregn in silver packs. OK thanks. Was a bit afraid because knowing my luck he might magically appear when opening my next gold box this week. Then what is correct? Triple droprate like it's said in the text above or droprate x2 like the News banner is showing? I think this is just a clerical error and it shouldn't affect anyone. He will continue to appear in silver box till Thursday night or till Friday 11am French time? DREG MT??! ARE UR SMOKING XANTIAX...I WANNA PIECE OF THAT TOO. C-Dregn a clone i think of him probably with his brain is so cool. nothing like haven a extra body on standby lol.